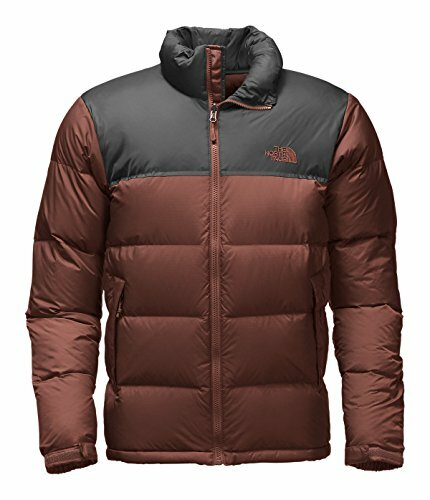 The North Face Men's Nuptse Jacket (X-Large, Sequoia Red/Asphalt Grey) by The North Face at Sherlock Coat. MPN: NF00C759CCK. Hurry! Limited time offer. Offer valid only while supplies last. A classic jacket for lofty, puffed warmth. 700-fill goose down insulation with nylon plain weave fabric. Double-layer taffeta on the shoulders. A classic jacket for lofty, puffed warmth. 700-fill goose down insulation with nylon plain weave fabric. Double-layer taffeta on the shoulders. Stowable in it's own internal chest pocket. Secure-zip hand pockets. Internal chest pocket. Hook-and-loop adjustable cuff tabs. Hem cinch-cord. Zip-in-compatible integration with complementing garments from The North Face. 100 nylon plain weave shell. 700-fill goose down insulation. Machine wash warm, tumble dry low. Imported. Measurements Length 28 in Chest Measurement 42 in Sleeve Length 35 in Product measurements were taken using size MD. Please note that measurements may vary by size.